Bill Gates is known for his amazing contribution to the world of personal computers in Microsoft. However, in recent weeks, he would be known for something else as well. As the man who drank water out of feces. Yup, you heard it right. Feces. But before you run to the bathroom and start throwing up, imagine this: If you could turn human waste into something useful like electricity and drinking water, would you not do it? For Bill Gates, it’s a yes. And that is why billionaire has showed his support to a bioenergy project called the Janicki Omniprocessor. The Omniprocessor was designed by Janicki Bioenergy, a Seattle-based engineering firm. Using the machine, human waste is burned and processed so it becomes electricity, water and ash. The invention is groundbreaking because not only does it give a new way to produce clean drinking water, it also addresses the concern of improper waste management. Some people in far-flung areas do not have access to toilets with proper drainage. Other, meanwhile, does not have actual latrines and are forced to defecate in any open area. With this machine from Janicki Bioenergy, people finally have a way to dispose of their wastes properly with a good return – drinking water. Not only that, the machine also produces energy. It could come up with 250 kilowatts of energy from waste of around 100,000 people. 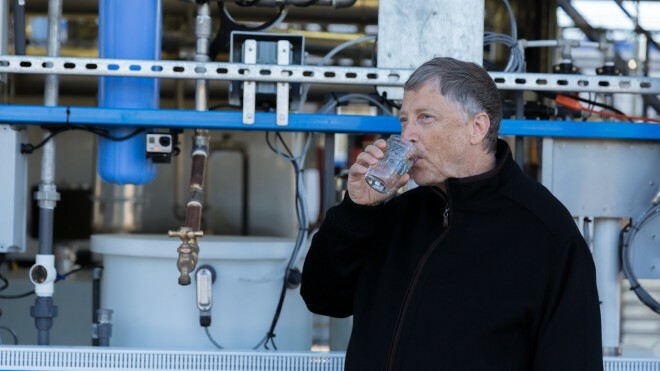 “If we can develop safe, affordable ways to get rid of human waste, we can prevent many of those deaths and help more children grow healthy,” said Gates. The Janicki Omniprocessor is now in Senegal for a trial run with a local community with the help of the Bill and Melinda Gates Foundation.